Add some magic to your next Halloween, a fun costume party, trick-or-treating, and much more when you get Witches and Wizards Costumes for everyone! You can become part of the wonderful world of Harry Potter, Disney characters, the Wizard of Oz, and many more, great for all kinds of fun! The servants of the night have arrived, conjuring spells, pulling off tricks and stunning mere mortals with their magic. 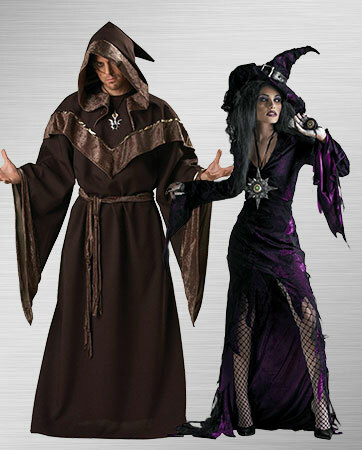 Yes, it is the time for witches and wizards, and no matter how many hours you’ve spent perfecting your magic chants or trying to turn your boss into a newt, chances are you don’t have a get-up quite as cool as what we have here at BuyCostumes. Whether you choose to appear as a Dark Sorceress or you are more at home in Elphaba’s “wicked” black dress, we have something for you. Graduates of Hogwarts and other elite sorcerers are included in our vast, mystic wardrobes. And for the little darlings just learning to unlock their magic powers, there is the darkly elegant Glamour Witch Child Costume and an adorable Hocus Pocus costume for your toddlers. 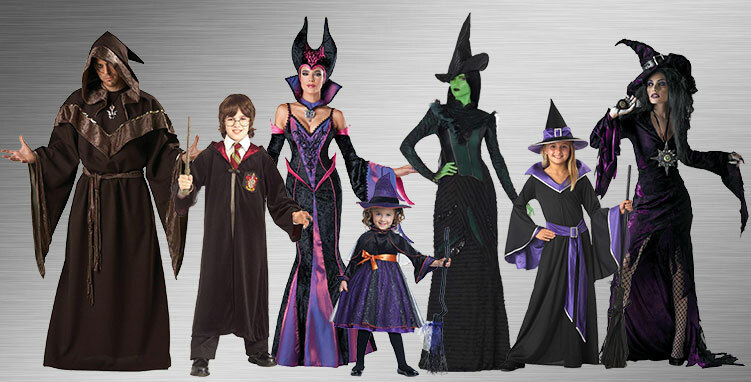 With costumes for all ages, we have what you need to put together the ultimate coven. Is she really “wicked” or just misunderstood? For a while we all thought she was a dog-snatching, water-hating, green-skinned ne’er-do-well. Turns out Elphie was something of a hero fighting the tyranny of Oz. This premium costume includes a black satin top with lace accent that forms to your figure, a frilled skirt and matching snake-print witch's hat. If your child is the belle of the ball type, then chances are she’ll also want to bring some bling to the black arts. Everyone knows that the traditionally drab, black witch's outfit could use some flash, and this costume provides just that. The full-length dress features a purple and silver detail. Shining silver buckles adorn the hat and the belt. Does the world’s most famous wizard really need an introduction? With this costume, your little guy will look like he just stepped out of Hogwarts for vacation. This premium costume comes with a satin-lined, black velvet robe with an attached hood and a Gryffindor crest on the front. Who says you’re too young to be dabbling in magic? You know she’s full of tricks and mischief, and we have the perfect costume so she can dress like her favorite witch from the hit movie Hocus Pocus. This costume includes a witch’s hat, dress and capelette with collar. In colonial times, the life of a witch was fraught with peril. There was plenty of hysteria and madness that brought a few to trial, but no punishment could silence the dark powers! Become a resurrected Salem witch with this Halloween costume, which comes with a blood-stained apron, dress, collar, hat and noose. Before you transform yourself into a dragon and wreak havoc on those who deserve it, make sure your robes are in order. With this costume, you'll be the spitting image of the "Mistress of all Evil," which suits you just fine. Costume comes with a satin dress with bodice, petticoat, collar, sleeves and headpiece. Hogwarts' finest are about to make an appearance in your neighborhood. Their powers are at their heights, but what wizardry can make their student loans disappear? Our collection includes Gryffindor robes for the kids, and when they’re ready to put down their books, we have the latest Quidditch active wear! But, as everyone knows, the world of Harry Potter isn’t just for the kids. There’s a Harry Potter deluxe adult costume, so even when you’re deep into middle age, you can fight the forces of Voldemort. For the ladies, we have Luna Lovegood to assist in all magical endeavors. For the more supernaturally inclined, there’s the ghostly (and whiney) Moaning Myrtle. 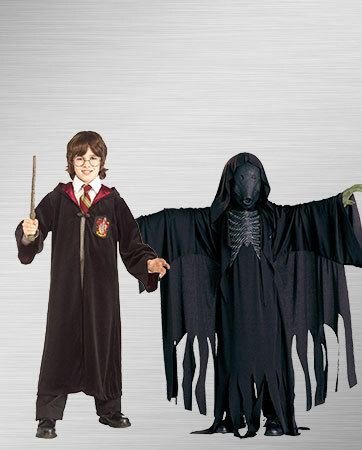 And since it’s not all light and goodness in the world of muggles and wizards, we’ll give your child the option to go as a sinister Dementor! 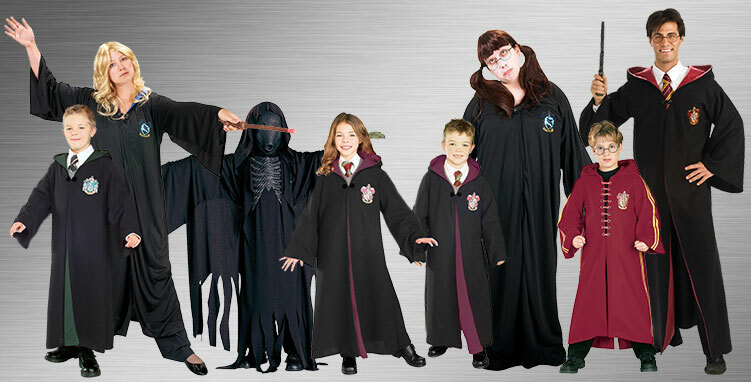 With the wide variety of costumes, you’ll be able to recreate your favorite Harry Potter scenes this Halloween! Opposites pair well together, and there’s no greater contrast in the land of Oz than that which exists between the Wicked Witch of the West and the Good Witch Glinda. If you have a friend who’s the good to your wicked, then this is the pairing for you! 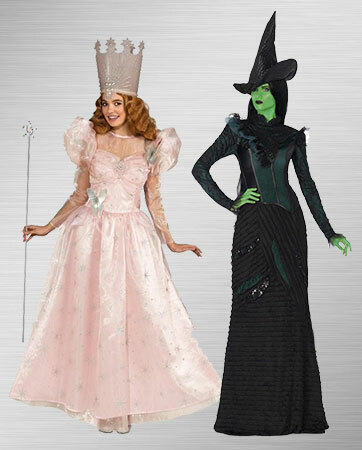 Glinda costume comes with a dress and a crown, and Elphaba comes with a detailed black dress and hat. Some couples settle into a routine and become rather boring, but others manage to keep the magic alive. Literally. This conjuring duo brings all the mystery of the nether realms to their romance, and to the party. The sorcerer includes a detailed robe, hood, sash and medallion. His beloved sorceress comes with a satin dress, bodice, petticoat, collar, sleeves and headpiece. There’s nothing more entertaining than when the forces of good and evil collide, especially if it’s straight out of the pages of Harry Potter. If you have a pair of kids on your hands who love the books and fight like wizards and dementors, then this is the perfect option. Harry’s robe comes with an attached hood and a Gryffindor crest, and the dementor costume comes with a mask, robe and chest piece. Witches come in all sorts of devilish guises. Well, in this case, they’re rather adorable guises. If your little girls have a tendency to make their mischievous magic as cute as anything can be, then here's the pairing you’ve been looking for. 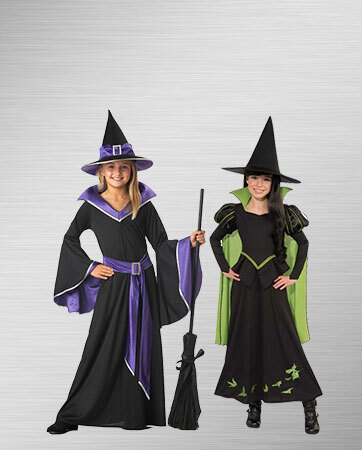 The Wicked Witch of the West costume comes with a cape, dress and hat. The Hocus Pocus Witch includes a hat, dress, capelette and collar. Get ready for the ultimate battle between the sexes. Put your money down on who will emerge as the victor. Will it be the witch, whose detailed black costume and hat will give any lady a bewitching look? Just add a broomstick and you are ready for battle. The wizard is ready for the showdown. Will it be the lovable wizard or the wicked witch that wins? His fully sculpted face is complemented by a hat, poncho, and robe. Get your wand or staff out and start casting your incantations. Not every little girl is scared of spiders, and some positively adore them in the same way others love puppies or kittens. Dressed as Spiderina, the master of arachnids, you little darling will command these frightening creatures in the most adorable way possible. In addition to the costume, we have the accessories to make the night complete. It begins, of course, with the shoes. Our Hazel Child Shoes are straight out of a ghost story and perfectly suited for a night of candy-gathering. Speaking of candy, our Spiderina Child Bag is the perfect way to store all her sweets. Finally, the spider ring and bracelet allow her to keep her eight-legged friends nearby.